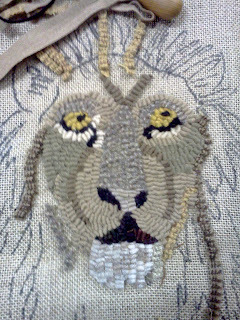 Only a little more done on the lion today. I didn't get to the store until 3:00 and then had customers in and out the rest of the afternoon. I had one Indian chief who bought an antique microscope for his medicine woman's valentine present, and then I had a little woman who grew up in New England but has always wanted to live in England, in high society a century ago - she makes button greeting cards. Funny what you learn about customers. I think I almost like talking to customers as much as I like hooking! I had one grumpy guy who strode in, strode to the back of the store, strode back, said, "Got any local photos?" and I said, "No". I do, but he walked right by them twice and I didn't feel like sharing them with a grump. I'm thinking about putting whatever local history I have into a little book - I may run an ad asking people to share stories about my building. I heard one the other day from Donna at the Senior Center - she met her first husband at a dance upstairs (in what is now my rug hooking studio). She went to the dance with a girlfriend. This man walked right up to the girlfriend and then turned and asked Donna to dance - and then she said, "and we danced together for twenty years!" Lots of people have told me stories over the years and I should have written them down. I guess I can't start any sooner! Your lion is coming along nicely and I'm enjoying the journey with you. Interesting people you get to meet at your shop.